Order your Firewise homeowner's kit! As a homeowner you must realize that the threat of wildfire is real. Minnesota alone has more that 2,200 fires a year. Fire is an inherent danger to having a home in the woods, but that doesn't mean you can't something about it. 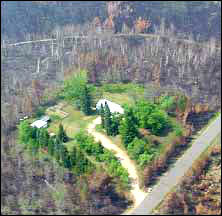 In fact, creating a defensible space around your house will enable your home to survive a wildfire. Prepare for Wildfire: The Hwy 1 Fire Wake-Up call - This video addresses community preparedness in the face of the recent Highway 1 wildfire in Ely, Minnesota. It gives residents the tools they need to prepare for this kind of event should it happen again in the future. Living With Fire: Why and How - This video provides information and useful tools for residents who live in a fire prone environment to reduce their risk of property loss. Is your home protected from wildfire?